Enjoy a delicious new version of a childhood favorite. This vegan cheese sauce also makes a rich and creamy topping for broccoli, asparagus, potatoes, and other vegetables. It’s rich, tangy and completely satisfying! I want to give a special thanks to Laura Theodore, the Jazzy Vegetarian, for sharing her quick and easy sauce-thickening tip. 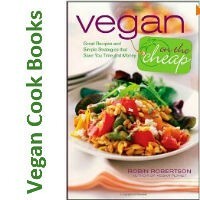 This quick and easy vegan mac and cheese recipe is perfect for Meatless Monday or any day of the week :) Reprinted with permission from It’s Easy to Start Eating Vegan by Rebecca Gilbert. Now available for Kindle too! 1 ½ cups unsweetened non-dairy milk* (I use So Delicious unsweetened coconut milk in the green package). 1. Cook the macaroni according to the instructions. While the macaroni is cooking, prepare the sauce. 2. Add all sauce ingredients to a pot except the flour and parsley. Use a whisk to combine well. Cook over medium heat and bring to a boil. 3. Now it’s time to thicken the sauce. Add 3 tablespoons of cold plant milk plus 1½ tablespoons of whole wheat flour into a glass jar with a tight fitting lid. Shake vigorously to combine. Add mixture back to sauce. Stir with a whisk to eliminate any lumps. Reduce heat to simmer and cook for about 5 minutes, stirring constantly, until sauce reaches desired consistency. If sauce gets too thick, add more milk. 4. Transfer macaroni to serving bowl. Pour cheese sauce over macaroni. Garnish with parsley. 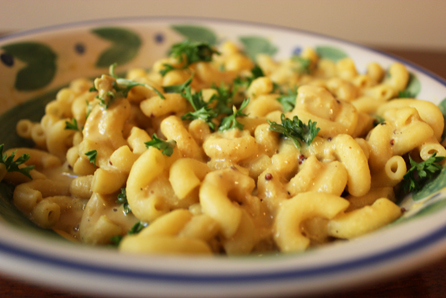 Let us know what you think of this easy vegan recipe: Mac and Cheese!